Growing green peas at home- All that you should know! I hope you would have loved my previous blog post about “summer squash”. I was wondering what to write about when this frisky thought of “green peas” came to my mind. Actually, I was munching on green peas when this idea popped out. Remember, when I say I was eating it, it is purely grown at home and hence the tag –“organic” can be applicable here. You may wonder it is a tough thing to grow green peas but trust me; this is just a simple thing as eating jalebis that you yourself make! Got the catch? Okay, now I am going to explain the process for the famous search term “How to grow green peas from seeds?” Buckle up and let us start now! How to grow green peas from seeds? It is always a wonderful feeling to grow and harvest plants on your own. I especially love growing legumes. Harvesting them in batches (bunches, of course) is a splendid feeling, as your basket will be full in a jiffy. Growing green peas will give you complete satisfaction, especially with the “organic” tag attached to it. If you are planning to start a container garden, then I suggest adding green peas to the list will certainly do well. Power packed with plenty of nutrients, the fluffy texture, and the perfect blend it gives to the dishes, makes this a wonderful companion in your kitchen garden. Water, water and water. This plant requires a lot of water, especially if you are planning to grow in a container, you may have to water it thrice a day. Sunlight is the booster needed. Peas need enough sunlight for the growth and hence you should find a sunny spot for that. Before sowing the seeds you should come to a conclusion about the variety to grow. Normally, green peas are opted by many. Choosing the seeds is a tricky part. To make sure your seeds are of good quality, you can check them easily by soaking them in water. If you see some seeds floating, they should be kicked out! Fine as it is! For container gardening, you should pick out the right size of the container for this plant. For gardens, a moist, sunny spot would do. Since this blog is purely about how to grow green pea plants in pots, we can concentrate on container gardening! Here is a list of few things that you may need to grow in containers. Preparing your container is a very crucial part and hence you should spend enough time for this. After all, it is where you are going to get your yield! It is always good to fill the container almost completely. Just leave about 1 inch of space on the top. If your container is huge, then you can fill the bottom with stones or dry leaves. I filled the bottom of my container with coconut husks. This helps with drainage and at the same time, the husks will decompose over a period of time. Brilliant, isn’t it? Using a good potting soil is very important. If you are using just red soil, then make sure to mix enough nutrients. I used red soil, with sand, organic manure in equal portions. 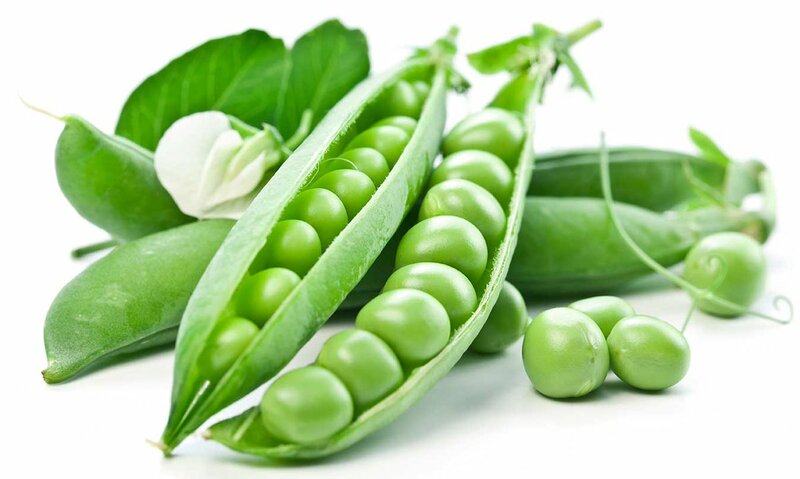 Since peas are a legume, make sure you do not use fertilizers rich in nitrogen, as this will harm the production. Fill your container evenly with the soil mix and gently pat it. I love this step; the richness of the soil when touched with bare hands will give you a heavenly feel. How to plant pea seeds? If you are planning to sow seeds directly then just poke your index finger in the soil to create a small pit to sow the seeds. If the container is big it can easily accommodate two to three plants. Therefore, plan it well before. When using a germination tray then you will have to wait until the root ball forms and then transplant to the container. Click here to read some basic germination tips. Once you have sown the seeds in the container, make sure to water it. Another thing to note is not to cover the seeds with a lot of soil as it will create some problems with the germination. Use a watering can to water the soil. It should be moist but not wet. Keep the container in a place where it gets full sunlight. As I said before, peas need good sunlight. Setting up the trellis is something that I love. Normally, I use the branches cut from other trees. However, you can use bamboo sticks tied together in a teepee shape. This will be perfect for that. In my case, I used dried branches from my custard apple tree. Peas need good support while growing, as they are climbers. However, in the initial stage of growth, you may have to help them start climbing on the trellis. It is a beautiful sight to see the growth of the plant with the shoots and tendrils dancing beautifully in the wind. How long does it take to grow peas? Okay, now is the tricky question that many of you ask. “How long does it take to grow peas?” “When can I harvest?” As always, harvesting is the fun part which I love to the core. Normally, you can harvest them in about a month from the date of sowing. However, this depends on the pollination too. Harvesting peas is a wonderful experience. Harvest them once they ripen. The pea pods should be plump, which is a clear indication that there are plenty of juicy, fresh peas for you. Once the harvest season has started, you should check the pods every day. Once you find the pods with the desired size, then take out your harvesting basket and start picking the pods. As always, you should also be aware of the pests and diseases that may affect your pea plants. There are four main diseases to look for. Fusarium wilt: If your plant starts to turn yellow and wilt then it is a clear indication that fusarium wilt has started. This is a soil-borne disease and most of the plants succumb to this. The only remedy to this is to treat the soil with solarization. Powdery mildew: This normally affects the plants in cool and moist temperatures. Using natural and homemade fertilizers and fungicides you can easily get rid of these. However, there are plenty of pests that will flock towards your plants once they start blooming. Aphids: Not only green peas but plenty of other plants also get affected by these critters. The best way to get rid of them is planting plants that attract ladybugs. Pea weevils: Another creature that destroys those plants. They lay their eggs on the pea seeds. Once the eggs are hatched, they much on the entire plant. Other pests include leaf miners, nematodes, spider mites, and so on. Using a good and organic pesticide will prevent the damage caused by these critters. You would have heard the term “companion planting”. It is always a good thing to plant few varieties of plants together. Just as you feel happy when you are in the company of your friends, plants too behave in the same way. When it comes to green peas they love the company of the following plants. While munching on the green peas, I just thought about the calories that are being added to my body. My little one was also munching a bowl full of green peas and hence I got this sudden urge to check on the nutrition value of peas. As a result, here is the chart. Quite happy and contented. I was on seeing this that I went to grab another bowl! If you are lacking folic acid, then consuming fresh pea pods will help you gain that. Fresh green peas come packed with plenty of anti-oxidants along with Vitamin A. vitamin A helps in maintaining a healthy skin and eyesight. Now that you have known all about growing green peas at home, then why not kick start it? The seeds at Trustbasket are quite noteworthy and have a good germination rate. P.S I bought mine here and that is why I am so confident! I hope you will share your experiences in the comments below. Stay tuned for I will be back with another interesting blog post.